This entry was posted in Religion and tagged Catholics, Christianity, Religion, Religious Doctrine, Stupidity by Les. Bookmark the permalink. Standards on the host & wine are possibly for the best, twinkles & bourbon would be entirely too weird. I dunno. Twinkies and bourbon could possibly lure me back into church attendance. Pity Heinlein didn’t think of that for the Fosterites in “Stranger in a Strange Land”. 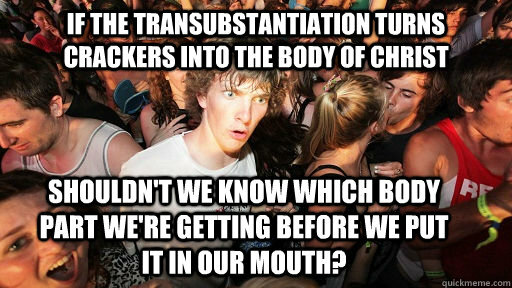 The methodists, and I believe most other Protestant denominations, don’t believe in actual transubstantiation. For them its figurative. 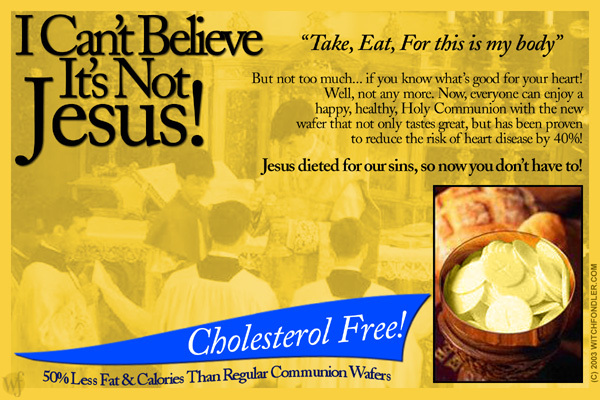 Its only the catholics who think they are getting actual bits of Jesus.